Last week I posted an adaptation of Mark Bittman’s recipe for Black Bean Burgers — fast food, much improved – and I promised to post the companion Mexican Chocolate Shake and Sweet Potato Fries today. He created his version of healthy fast food, which I recreated in my kitchen. The burger, shake and fries were indeed edible, downright mouthwatering, in fact. But fast? Hardly; it took me over an hour to make dinner, and the shake still wasn’t chilled to perfection. If some savvy chain, however, were to streamline these recipes, hitting all of the sweet spots (tasty, inexpensive, drive-through friendly, and healthy), the fast food industry could well be revolutionized. The next day the shake was more like a delicious chocolate pudding. I blended it with additional almond milk until it was, again, sippable through a straw. 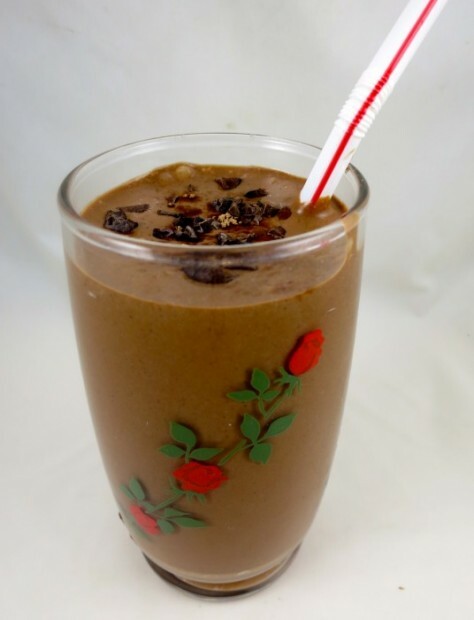 I used cocoa nibs to garnish the shake, instead of the chocolate shavings used in the original recipe. Unlike the Bean Burgers, I made no changes to the chocolate shake and fry recipes that Bittman posted. Indeed, that shake puts chain shakes to shame. Place sugar, milk, tofu, melted chocolate, vanilla and cinnamon and chili powder, if using, into a blender. Purée until smooth. Chill for at least 30 minutes in the freezer, or refrigerated several hours. Before serving, garnish with cocoa nibs or chocolate shavings. Cut the sweet potatoes into sticks 1/4 to 1/2 inch wide and 3 inches long, and toss them with the oil. 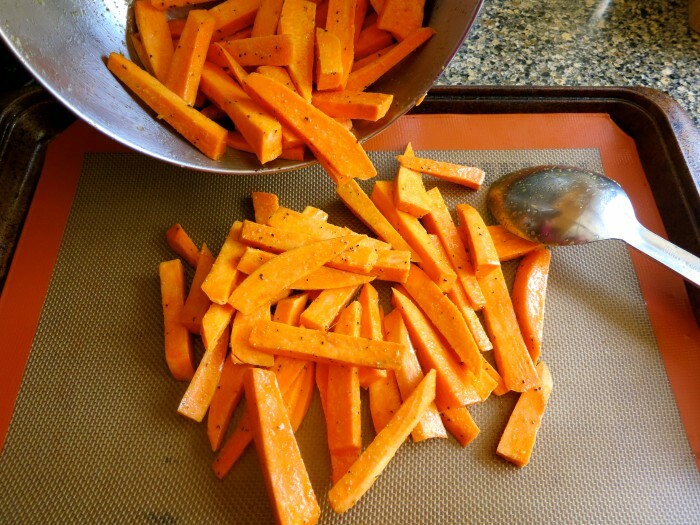 Mix the garlic powder, salt and pepper in a small bowl, and toss them with the sweet potatoes. Spread them out on 1-2 rimmed baking sheets. Bake until brown and crisp on the bottom, about 15 minutes, then flip and cook until the other side is crisp, about 10 minutes. Serve hot. More Recipes Filed Under "All Beverages"